Im Durchschnitt wird dieses Tutorial InfluxDB – Monitoring with TIG Stack mit 5 bewertet, wobei 1.0 die schlechteste und 5.0 die beste Bewertung ist. Es haben insgesamt 708 Besucher eine Bewertung abgegeben. As a follow up to the tutorial InfluxDB on Ubuntu 16.04/18.04 install and get started and the application scenario started in it, I will introduce you in this tutorial Grafana as a possibility of analysis, preparation and management of measurements stored in InfluxDB. I will continue the mentioned application scenario by plotting the data points included in the database named OnlineMarketDevelopment as part of the measurement named SalesActivity in Grafana. As already mentioned in the tutorial above, the integrated open source project Grafana offers a component for the user interface for the management, monitoring and graphical processing of measurements contained in InfluxDB. Integrated means that both InfluxDB and Grafana are components of a stack, the TIG stack. In the tutorial about InfluxDB – Monitoring with the TICK-Stack I already showed you how to install and set up the single components of the TICK-Stack and how to use Chronograph in the context of this stack. Besides Chronograph, Grafana represents another option as a monitoring platform. The TIG stack consists of the three components Telegraf, InfluxDB and finally Grafana. As in the case of the TICK stack, Telegraf also forms the interface for the TIG stack to send data stored in InfluxDB to the monitoring platform – in this case Grafana. As with the TICK stack, data stored in the TIG stack with InfluxDB can therefore not only be stored in a retrievable form, but can also be transferred to the monitoring platform at any time via telegraph. 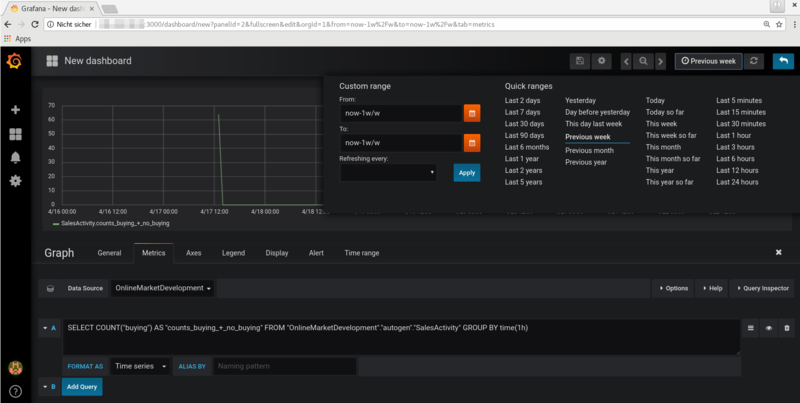 Finally, Grafana acts as an infrastructural monitoring tool based on Telegraf and InfluxDB. First, these three components must be downloaded, installed and configured so that you can use this infrastructure. Since we have already installed and configured InfluxDB together in the tutorial InfluxDB on Ubuntu 16.04/18.04 and have set it up successfully, and you have successfully installed and configured InfluxDB in the tutorial InfluxDB – Monitoring with the TICK-Stack has received instructions on how to install and configure Telegraf on your server, among other things, I’m now directly dedicated to the last part of the TIG-Stack. To download and install Grafana, you must execute the three commands in your terminal that you see in the code snippet below. The version – in this case it is 5.0.4 – is interchangeable. Then it is necessary to execute the commands shown in the following code block so that Grafana starts. This will also ensure that Grafana will start automatically after the restart. Next, I’ll show you how to configure Grafana. To do this, request http://localhost:3000 in your browser, since Grafana is available on port 3000, where you exchange localhost with the IP address of your server. 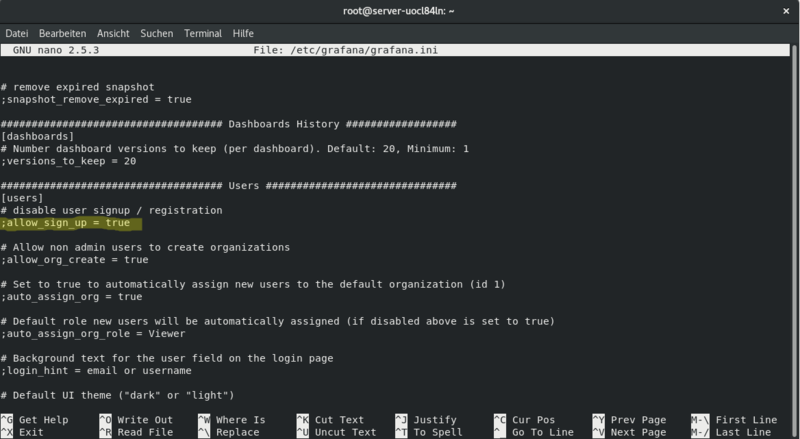 This will take you – as shown in the screenshot below – to the Grafana login page, where you can access the monitoring platform using default user data. The default username is admin and the default password is admin. On the login page you would also find the button for the registration. In order for it to be visible and usable, however, you would have to make an adjustment in the Grafana configuration file. If you want to register as a new user, you have to open the Grafana configuration file in an editor using the command shown below. In my example I do this with the nano-Editor. In the configuration file, scroll down to the [users] sequence as shown in the screenshot below. There you will find the allow_sign_up parameter in the disable user signup / registration section. In the screenshot below, the line in question is highlighted in yellow. First, you must set its value to true if it is set to false by default. You must also remove the semicolon in front of the parameter, as it will cause the line to be interpreted as a comment. Pressing the combination of the keys Ctrl and O initiates the saving of your changes in the configuration file and confirms the file name shown in a white bar with the Enter key. Then exit the nano editor by pressing the combination of Ctrl and X keys. To finally activate the changes, you must restart Grafana using the command shown below. By executing the following command you can get the status of the server to make sure that everything runs smoothly. The output will then give you a positive report about Grafana being active. When you then reload the browser, you will see the Sign Up button for registration. Once you are logged in, you will be on Grafana’s home dashboard, as shown in the following screenshot. By clicking on the linked icon Add data source, you will be redirected to the page where you can establish the first connection to a database and thus define the communicating interface between Grafana and a database. As you can see from the screenshot below, you can specify on the respective page to which database the connection should be made and to which context the database should be assigned. According to the application scenario introduced in the tutorial InfluxDB on Ubuntu 16.04/18.04 install and set up my database in this example is called OnlineMarketDevelopment and is of type InfluxDB. The type assignment provides you with a possible selection of types with which Grafana can be used via a dropdown list. You can also define the HTTP settings. In the field for the URL you enter the URL http://localhost:8086, because the HTTP service of InfluxDB is available on port 8086, where you exchange localhost with the IP address of your server. You can also use a drop-down list to specify your HTTP settings as proxy or direct. If your choice is proxy, the request will be represented by Grafana’s backend. However, if you choose direct, the URL will be used directly by the browser. In my example, I decide to handle the access via the option direct. Additionally you have the possibility to set the way for HTTP authentication via checkmark boxes. Finally, you provide information about the interface that establishes the communication between InfluxDB and Grafana, and finally you can specify the height and the unit for the automatic grouping by time interval for the data collection, e.g. 1s stands for an interval of one second, 10m for one of ten minutes, 1h for one of one hour, etc. You then confirm the configuration by clicking on the green button and you will be shown a message after successful setup, which tells you that your database works with Grafana. You can edit existing database resources and/or add new ones at any time. This is possible on the Configuration page. The screenshot below shows you that you can reach this page via the fourth menu item in Grafana. The clicked menu item gives you information about the contents of the Configuration page via the fly-out menu, which can then also be called up afterwards on the page itself via tabs, as the screenshot below demonstrates. The tab Data Sources lists the existing database sources. By clicking on an item in this list, you can change the information with which you configured the item or even delete the item. By clicking on + Add data source you can add a new database source. Via the tab Users you can add users and via the tab Teams you can define teams. The tab Plugins provides you with a list of integrated plugins from which you can freely choose. The Preferences tab is used to modify the name of your profile, as well as settings concerning the appearance of your monitoring platform (light/dark), the type of your home dashboard and the time zone. In the tab API Keys all your existing API keys are listed and here you can add new API keys to the panel. In Grafana dashboards are offered to display the information obtained via queries from certain databases contained in InfluxDB in a clear and retrievable way. As you can see in the screenshot below, you can use the fly-out menu of the Create menu item to take various actions to create a dashboard or a dashboard folder or to import a dashboard. You can import a dashboard either by copying and pasting its URL or ID into a designated field, by transferring the contents of its associated JSON into an editor field, or by uploading a JSON file directly and generating a dashboard. After I install and set up the measurement according to the tutorial InfluxDB on Ubuntu 16.04/18.04 and set it up as indexer for the measurement SalesActivity in the database OnlineMarketDevelopment, I want to monitor them in Grafana and will create a dashboard as an example. As soon as I have clicked the submenu item Dashboard of menu item Create, I land on the page where you can generate new dashboards. The screenshot below shows you the different types of visualization that are provided. In this example, I will choose the graph as the visual medium for my dashboard. As already noted in the sketch of the application scenario, the data points I implemented in the InfluxDB database OnlineMarketDevelopment refer to a period of 15 minutes, strictly speaking to the period from 13:00 to 13:15 on April 17, 2018.04.2018. The right column shows all operations performed to simulate the application scenario INSERToperations for the measurement SalesActivity. For your convenience I have documented the corresponding time stamp in the left column. After clicking the Graph button shown in the screenshot above, an empty graph dashboard is generated. In the screenshot below I show you that clicking on the title of the dashboard opens a fly-out menu that gives you different options to interact with the dashboard. To fill it with information, click Edit. In the screenshot below, I am currently in the Edit option. Beside editing, you can simply view the dashboard by clicking on View or switch to view mode. By clicking on Share you can share the dashboard. Via the menu item More you can export the dashboard into CSV format or transfer the dashboard into JSON format. In the dropdown list of Data Source in the tab Metrics I can select the database I want to monitor information from. By clicking on the Add Query button below, a button to generate a query is displayed, as the screenshot below shows. With the included buttons I can define the parameters of my query and don’t have to write them into an editor. In my example I prefer to write the query myself. To do this I click the Toggle Edit Mode button to the right of the button. I have now entered my query into the editor that appears, which can be seen in the screenshot below. You can see from the query that I did not define the time period of the data points I collected and want to plot using the WHERE condition, but only set the interval to one hour using the GROUP BY statement. Nevertheless, the time window is defined, namely – as you can see from the upper right half of the screenshot – via the Quick ranges selection from the panel that was displayed by clicking on the button above. Alternatively, you can use the button on the left side of the panel to specify an individual time window. I decided to use the Quick ranges Previous week offered under Quick ranges>/b> as the timeframe, as it is good for the 1-hour interval. Below the plotted graph you can see the corresponding legend. This legend can be generated in the tab Legend via checkmark box and there you also have the possibility to determine if values like minimum, maximum or average should be displayed below the graph. If you click on the legend below the graph, you will see a color palette from which you can choose a suggested color for the graph or even define your own color if required. Click the button above the panel again to hide it and keep the time frame active until it is either overwritten in the query in the editor or redesigned in the panel itself. With the $timeFilter parameter you can also define the time window in the query yourself, as I will show you in the following code snippet below. For the correct syntax of the value behind the parameter you can use the panel just mentioned. If you click on an item from the Quick ranges panel, the corresponding syntax will be generated in the input fields on the left side of the panel. Thus the value now-1w/w would reflect the time frame of the previous week. The screenshot below again shows a section of my work in the generated graph dashboard, where I individually set the time window of the plotted data points using the button provided on the left side of the displayed panel. Analogous to my data collection, I have defined the time frame for 17.04.2018, starting with 13:00 and ending with 13:15. Here I have defined the time frame via GROUP BY Interval in the query is set to one minute. The code block below contains the same query as the one you see in the screenshot. down in the screenshot I show you how you can manage the design of a graph in the tab Design. Here you have the possibility to display the graph either as line or bar graph, to include a marker of the data points, to determine the line thickness of the graph, as well as to determine whether the graph should be transparent or filled with a certain degree of color. Grafana is an advanced monitoring platform, you can plot multiple queries simultaneously. To demonstrate this to you, I will generate three new editor fields in the tab Metrics by pressing the button Add Query, in each of which I include one of the queries in the following three code snippets. The screenshot below demonstrates the final result of my monitoring conducted in the context of the four queries. The graph of the first query shows the total of all activities of visitors to the online shop per data point, including both visitors who have made a purchase and those who have only browsed the online shop. The graph of the second query, on the other hand, only plots the number of purchases made. The third and fourth queries are also used to plot the number of purchases, depending on the age group requested in the query in question via WHERE condition. When you move the mouse pointer over the data points of the plotted graphs, you will see a small data overview as mouseover effect, as shown in the screenshot above. By clicking on the Save icon in the upper left corner of the toolbar, you can save the created dashboard item and access it afterwards at any time to edit or delete it. In the save interface that appears, you will be asked for the name of the dashboard and must either select an existing dashboard folder from the drop-down list or create a new one. After saving is complete, the dashboard item will be in the dashboard, as shown in the screenshot below. You can add new items to the dashboard using the first button in the upper left corner of the toolbar. Via the gear icon you get to the settings of the dashboard-item. For graph(s) in a dashboard item it is possible to formulate a notification rule. I will show you how this works using the example of the dashboard item shown in the screenshot above. First you have to switch back to the edit mode of the dashboard item by clicking on the title and selecting Edit from the fly-out menu. If you then navigate to the tab Alert in the tab bar below the plotted graphs, you will see the button Create Alert on the left directly below. After pressing the button, a button will be generated to create a notification rule with one or more conditions for the plotted graph(s). In the screenshot below you can see that you can first enter the name for the configuration of the notification rule and the interval of the evaluation. Below you have the possibility to define the conditions for notifications via the provided buttons. If you click in the field that follows the keyword WHEN, you can choose an aggregation function from a drop-down list. For example, the aggregation function avg() can be used to control how the values for each series are reduced to a value that can be compared to the threshold value. The next field defines which query should be executed on the Metrics tab. Here you have the option to adjust all parameters in the query parenthesis. By clicking on each of the three parameters you activate a drop-down list of suggested values. The first parameter refers to the query from which one of the graphs is plotted in the Metrics-Tab. With the following two parameters the time range can be fixed. 5m as value for the second and now() as value for the third parameter would set the time frame 5 minutes ago until now. Then the threshold value is determined. You can enter a threshold value in the input field provided for this purpose. Via the button in front of the threshold value, the type of the threshold value is assigned by clicking on the button and selecting a suggested type from the drop-down list generated. Under the created condition there is a + icon with which you can generate any number of new buttons for conditions. In the following screenshot I set a condition for each of the four graphs plotted via query in the Metrics tab, namely for query A, B, C, and D. For each of the four queries the time window is defined to 10 minutes and the notification should happen for each of the queries if the threshold value is above the value 10. In relation I have set these four notification rules via the Boolean OR operator. By clicking on the button it is possible to convert the OR operator into an AND operator, depending on how the logic makes sense. It would also be possible to create more than one condition for one and the same query - e.g. query A. Parallel to creating notification rules it is possible to set up notification channels. To do this, navigate to Notification Channels via the fly-out menu of the Alerting menu item in the Grafana menu on the left. Then you can use the Add channel button to generate a new channel item. The screenshot below shows the interface in which you can set up the notification channel and edit it at any time afterwards. Among other things, you can specify the type of the notification channel by activating the drop-down list in the type field and selecting one of all possible event handlers. This is defined so that Grafana can send notifications to the event handler of your choice and keep you up to date. The use of this service can be particularly useful for sending alerts to certain emails, to applications such as Slack or HipChat, or to a list of email addresses. This requires that you or the user for whom you set up this notification channel are registered with such an application. Different event handlers may require different and specific data to establish the connection. This data is entered in the second half at the bottom of the interface. Certain required data must be obtained from the application in question, e.g. a token, URL or similar. You got to know Grafana as an advanced monitoring platform and I hope you have became curious to create your own projects with it. I wish you much success and above all, pleasure working with Grafana. Übrigens: kennst du schon unser Tutorial zum Thema Install GitLab on Ubuntu?